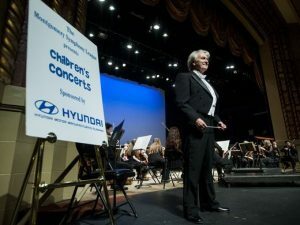 A project of the Montgomery Symphony League, the annual Children’s Concerts are a highlight for thousands of public and private school students in the River Region. For many of the 4,000 students who attend one of the two concerts, it is a first, and sometimes only, exposure to the excitement of a live orchestra concert. Through these educational concerts, the Montgomery Symphony Orchestra attempts to stimulate the imaginations of the youngsters and broaden their artistic horizons. These concerts feature an “introduction by example” to the various sections of the Orchestra – strings, woodwinds, brass and percussion. Frequently, a young soloist is selected to perform with the MSO on these concerts. The program always conclude with a series of “Guest Conductors” plucked from the audience taking the baton in hand and conductin the Montgomery Symphony. The concerts are open to sixth graders from all public and private schools, including home-schooled students.